Home » Brexit » Is Nigel Farage Under The Influence Of Brussels? 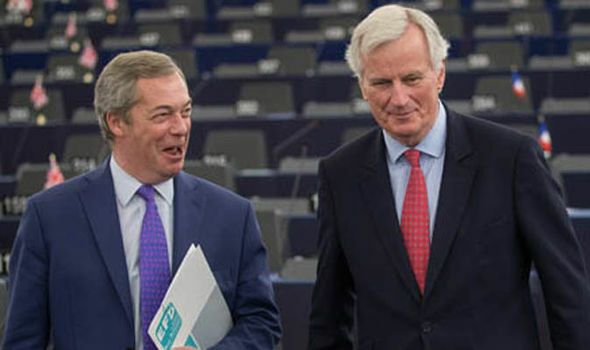 Nigel Farage is now considering a ‘SECOND REFERENDUM’ following his recent meeting, this week, with Michael Barnier the EU’s chief negotiator for Brexit. Arron Banks, the Brexit Leave Campaign Chief, has also come out in support of a second referendum. Nigel Farage and Arron Banks must be well aware that nothing is to be gained from a further referendum on Brexit, in fact the opposite is probably true, where the ‘remain camp‘ have everything to gain should the previous vote shift by a couple of percentage points in the direction of ‘remain’. Why then has an experienced politician and the Brexit leave Campaign Chief, who on the face of it supported Brexit, decide to call for a second Brexit referendum when there is already a mandate from the people in support of this policy? Why then did Theresa May decide to call a general election when she already had a sufficient majority, in the house of commons, to successfully take forward Conservative Party policies including Brexit? Lots of questions but no real answers. Theresa May was not a supporter of Brexit but appears to have engineered herself into a position where she could allow Brexit to fail and blame that failure on her small majority in the house. The Conservative Party are obviously content to leave her as leader (anyone else would have been dumped after losing a general election) so that when/if Brexit fails they can dump her and carry on as if nothing had happened. Nigel Farage was, on the face of it, a supporter of Brexit and we have a mandate for that, but he now supports a position, for a second referendum, in which only ‘Brussels and the Remain Camp’ can benefit. Can any of our politicians now be trusted with Brexit? I have serious concerns and have no doubt those anti-Brexit campaigners will be shouting from the rooftops at the prospect of perhaps being allowed a second bite at the cherry so to speak. 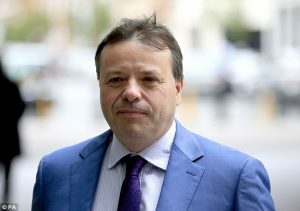 Arron Banks, Brexit Leave Campaign Chief, supports a second referendum. Tagged British Democrats, britishdemocrats.uk, Nigel farage and Brexit, Nigle Farage Calls For Second Referendum. Nigel Farage was ALWAYS a complete phoney. The bloke is basically an avid self-promoter and Tory and said the thing he is most glad about the rise of UKIP is that it prevented the BNP from getting a more prominent place in our country’s politics. To be honest, such was the level the BBC constantly promoted him (god knows how many appearances on Question Time when other parties like the Greens deserved them more on an real electoral support basis) at I wouldn’t be at all suprised to learn in a few years time that he was on the payroll of MI5/MI6/Special Branch. Farage will now be remembered as a traitor. He is a disgrace to all those who campaigned for our independence, and everyone who voted for our freedom. What a sell out. He ALWAYS was a sell-out which is why Zionist rags like the Daily Express so fervently promoted him and his GLOBALIST Thatcherite Tory ‘spare wheel’party of UKIP. IF he was genuinely interested in the cause of EU withdrawal he wouldn’t have pressed so hard for an in/out referendum because our reward for going down the quick fix referendum route will be a ‘Brexit’in name only ie one massacred to death by Tory remainers like Teresa May. Due to our hideously undemocratic FPTP electoral system real political power to shape Brexit remains with the overwhelmingly pro-EU political Establishment as it always has done! Nigel seems to have gone rather quiet, all of a sudden, perhaps he realises what a terrible thing he has said on national television, just to get attention, there is no way back for him. Even what little is left of UKIP have lost any respect for him. Nigel back tracked since, his point being that Brexit would win a second time too. However it shows how people must maintain a clear simple message and not play an opponent’s hands against them.